The Cordoba Dolce 7/8 Size Classical guitar features a solid cedar top and mahogany back and sides for a rich, sweet tone. 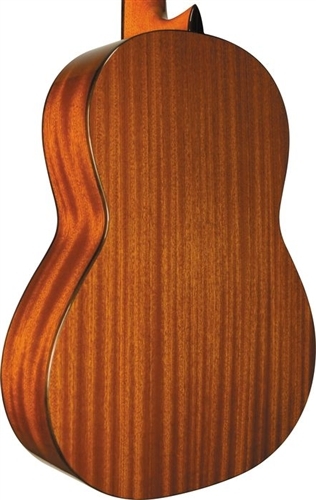 The Dolce has a comfortable neck with low action made out of Spanish cedar with an ebony fingerboard. The slightly smaller body size makes the Dolce ideal for female guitarists or younger students. Aesthetic appointments include a rosewood headstock overlay, a diamond patterned wood marquetry rosette, and gold plated tuners with pearloid buttons. Cordoba guitars are handmade in Spain by the same luthiers who have built instruments for the world-famous Gipsy Kings. This classical possesses a level of quality and tone not commonly found in this price range. Cordoba Mini Rosewood Nylon String Acoustic Guitar - Natural Cordoba CP100 Classical Guitar Pack - Natural Cordoba Protégé C1 3/4 Nylon String Guitar Cordoba GK Studio Negra Left‑Handed - Natural "Blemished"